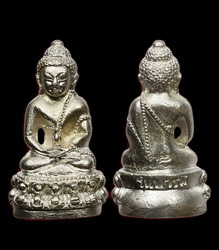 Phra Kring derives from the kling kling sound it made when you shake it, so it literally means Ringing Buddha. It is believe that this pleasant sound could bring happiness and harmony within oneself, and thereby strengthen one's awareness, thus improves one's spiritual mind, physical health and wealth. 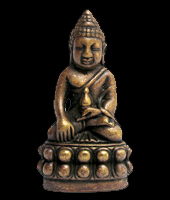 Although it took the form of medicine Buddha holding a medicine bottle from ancient China, it is still consider as Lord Buddha. Phra Kring Pawaled is perhaps one of the rarest and most expensive Phra Kring in Thailand. It was made famous by Somdej Krompaya Pawaled of Wat Bowon during B.E.2417-2425. Estimated not more than 30 pieces were specially made and presented to the royal family. It is therefore regarded as King of all Phra Kring. In BE 2530, in order to commemorate Thai King Bhumipol Rama 9 on his 60th years birthday, Wat Bowon decided to make a special Sound Buddha – Phra Kring Pawaled 2nd batch. 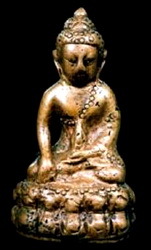 The temple decided to take the original Phra Kring Pawaled at the museum of Wat Bowon as a copy. A total of 25,000 sets of Phra Kring and Phra Chai were made. 9. Sacred material of making Somdej Chitlada – specially made by King Rama 9 with special material and his hair in 2508, was individually inserted inside each Phra Kring. To make it more prestigious, the old and tradition way to make old Buddha statue - wax lost method was used, and as such more than 50% ended up in bad condition, mostly are pitted, dented, out of proportion or partially damaged. Good and nice specimens are very rare. 3 separated major consecration rites were conducted. The 1st rites presided by Princes Pra Thep in Wat Bowon, the 2nd time is conducted by Somdej Phra Yansanwon in Wat Bowon, and the final one is presided by King Rama 9 himself at Wat Phra Kaew. 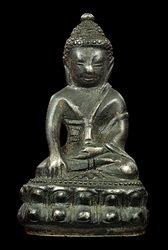 In B.E.2530, Phra Kring NaiRuang was rent for 5,000Bht from at Bowon. When I was in Thailand 11th August 2006, I met up with Mr. Sian Lee of Daily News one of the top media, he proudly showed me his latest collection, a beautiful Phra Kring NaiRuang which he bought at 440,000Bht a week ago, the face is well proportioned, body texture is smooth and clean, a perfect specimen, definitely worth the price. Before I returned to Singapore on 17th August, I was told someone had offered him 550,000Bht. It is definitely the wisest and best investment he had ever made.